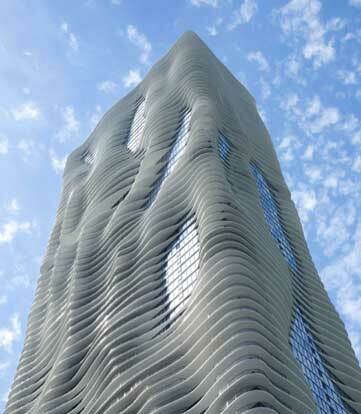 The Aqua Tower in Chicago is unusual for a couple of reasons. First, it has undulating balconies that make it appear to ripple. So it has a look that it is soft and flowing – which is not a common trait of steel and glass skyscrapers. Another unusual trait is that it was designed by a female architect. Now it is not that there are so few female architects in the world, it is just not so often that a female architect gets to design and build a tall skyscraper. If you look at most large-scale architectural projects in the world, very VERY few of them will be designed by women. See the web site of Jeanne Gang’s architecture firm, Studio Gang, to see more of the work that she accomplishes.